"You can know the name of a bird in all the languages of the world, but when you're finished, you'll know absolutely nothing whatever about the bird… So let's look at the bird and see what it's doing – that's what counts. I learned very early the difference between knowing the name of something and knowing something." "You have all I dare say heard of the animal spirits and how they are transfused from father to son etcetera etcetera – well you may take my word that nine parts in ten of a man's sense or his nonsense, his successes and miscarriages in this world depend on their motions and activities, and the different tracks and trains you put them into, so that when they are once set a-going, whether right or wrong, away they go cluttering like hey-go-mad." 5. Dysfunctional, self-defeating, and self-destructive even by his own yardsticks. Descriptive criteria aside, what is the essence of mental disorders? Are they merely physiological disorders of the brain, or, more precisely of its chemistry? If so, can they be cured by restoring the balance of substances and secretions in that mysterious organ? And, once equilibrium is reinstated – is the illness "gone" or is it still lurking there, "under wraps", waiting to erupt? Are psychiatric problems inherited, rooted in faulty genes (though amplified by environmental factors) – or brought on by abusive or wrong nurturance? These questions are the domain of the "medical" school of mental health. Others cling to the spiritual view of the human psyche. They believe that mental ailments amount to the metaphysical discomposure of an unknown medium – the soul. Theirs is a holistic approach, taking in the patient in his or her entirety, as well as his milieu. The members of the functional school regard mental health disorders as perturbations in the proper, statistically "normal", behaviours and manifestations of "healthy" individuals, or as dysfunctions. The "sick" individual – ill at ease with himself (ego-dystonic) or making others unhappy (deviant) – is "mended" when rendered functional again by the prevailing standards of his social and cultural frame of reference. In a way, the three schools are akin to the trio of blind men who render disparate descriptions of the very same elephant. Still, they share not only their subject matter – but, to a counter intuitively large degree, a faulty methodology. As the renowned anti-psychiatrist, Thomas Szasz, of the State University of New York, notes in his article "The Lying Truths of Psychiatry", mental health scholars, regardless of academic predilection, infer the etiology of mental disorders from the success or failure of treatment modalities. This form of "reverse engineering" of scientific models is not unknown in other fields of science, nor is it unacceptable if the experiments meet the criteria of the scientific method. The theory must be all-inclusive (anamnetic), consistent, falsifiable, logically compatible, monovalent, and parsimonious. Psychological "theories" – even the "medical" ones (the role of serotonin and dopamine in mood disorders, for instance) – are usually none of these things. “Two eminent retired psychiatrists are warning that the revision process is fatally flawed. They say the new manual, to be known as DSM-V, will extend definitions of mental illnesses so broadly that tens of millions of people will be given unnecessary and risky drugs. Leaders of the American Psychiatric Association (APA), which publishes the manual, have shot back, accusing the pair of being motivated by their own financial interests - a charge they deny.” (New Scientist, “Psychiatry’s Civil War”, December 2009). 1. Invariance: is it considered a mental illness across all cultures, periods in history, and societies? If it is, chances are that we are dealing with an objective, ontological, immutable diagnosis. 2. Is it the outcome of an ego-syntonic personal philosophy or ideology? If it is, chances are that this is a culture-bound syndrome, not a mental illness. Indeed, personality disorders are an excellent example of the kaleidoscopic landscape of "objective" psychiatry. The classification of Axis II personality disorders – deeply ingrained, maladaptive, lifelong behavior patterns – in the Diagnostic and Statistical Manual, fourth edition, text revision [American Psychiatric Association. DSM-IV-TR, Washington, 2000] – or the DSM-IV-TR for short – has come under sustained and serious criticism from its inception in 1952, in the first edition of the DSM. The DSM IV-TR adopts a categorical approach, postulating that personality disorders are "qualitatively distinct clinical syndromes" (p. 689). This is widely doubted. Even the distinction made between "normal" and "disordered" personalities is increasingly being rejected. The "diagnostic thresholds" between normal and abnormal are either absent or weakly supported. The polythetic form of the DSM's Diagnostic Criteria – only a subset of the criteria is adequate grounds for a diagnosis – generates unacceptable diagnostic heterogeneity. In other words, people diagnosed with the same personality disorder may share only one criterion or none. The DSM fails to clarify the exact relationship between Axis II and Axis I disorders and the way chronic childhood and developmental problems interact with personality disorders. The differential diagnoses are vague and the personality disorders are insufficiently demarcated. The result is excessive co-morbidity (multiple Axis II diagnoses). The DSM contains little discussion of what distinguishes normal character (personality), personality traits, or personality style (Millon) – from personality disorders. A dearth of documented clinical experience regarding both the disorders themselves and the utility of various treatment modalities. Numerous personality disorders are "not otherwise specified" – a catchall, basket "category". Cultural bias is evident in certain disorders (such as the Antisocial and the Schizotypal). · The effectiveness of various treatments – talk therapies as well as psychopharmacology. Certain mental health afflictions are either correlated with a statistically abnormal biochemical activity in the brain – or are ameliorated with medication. Yet the two facts are not ineludibly facets of the same underlying phenomenon. In other words, that a given medicine reduces or abolishes certain symptoms does not necessarily mean they were caused by the processes or substances affected by the drug administered. Causation is only one of many possible connections and chains of events. To designate a pattern of behaviour as a mental health disorder is a value judgment, or at best a statistical observation. Such designation is effected regardless of the facts of brain science. Moreover, correlation is not causation. Deviant brain or body biochemistry (once called "polluted animal spirits") do exist – but are they truly the roots of mental perversion? Nor is it clear which triggers what: do the aberrant neurochemistry or biochemistry cause mental illness – or the other way around? That psychoactive medication alters behaviour and mood is indisputable. So do illicit and legal drugs, certain foods, and all interpersonal interactions. That the changes brought about by prescription are desirable – is debatable and involves tautological thinking. If a certain pattern of behaviour is described as (socially) "dysfunctional" or (psychologically) "sick" – clearly, every change would be welcomed as "healing" and every agent of transformation would be called a "cure". The same applies to the alleged heredity of mental illness. Single genes or gene complexes are frequently "associated" with mental health diagnoses, personality traits, or behaviour patterns. But too little is known to establish irrefutable sequences of causes-and-effects. Even less is proven about the interaction of nature and nurture, genotype and phenotype, the plasticity of the brain and the psychological impact of trauma, abuse, upbringing, role models, peers, and other environmental elements. Nor is the distinction between psychotropic substances and talk therapy that clear-cut. Words and the interaction with the therapist also affect the brain, its processes and chemistry - albeit more slowly and, perhaps, more profoundly and irreversibly. Medicines – as David Kaiser reminds us in "Against Biologic Psychiatry" (Psychiatric Times, Volume XIII, Issue 12, December 1996) – treat symptoms, not the underlying processes that yield them. If mental illnesses are bodily and empirical, they should be invariant both temporally and spatially, across cultures and societies. This, to some degree, is, indeed, the case. Psychological diseases are not context dependent – but the pathologizing of certain behaviours is. Suicide, substance abuse, narcissism, eating disorders, antisocial ways, schizotypal symptoms, depression, even psychosis are considered sick by some cultures – and utterly normative or advantageous in others. This was to be expected. The human mind and its dysfunctions are alike around the world. But values differ from time to time and from one place to another. Hence, disagreements about the propriety and desirability of human actions and inaction are bound to arise in a symptom-based diagnostic system. As long as the pseudo-medical definitions of mental health disorders continue to rely exclusively on signs and symptoms – i.e., mostly on observed or reported behaviours – they remain vulnerable to such discord and devoid of much-sought universality and rigor. The mentally sick receive the same treatment as carriers of AIDS or SARS or the Ebola virus or smallpox. They are sometimes quarantined against their will and coerced into involuntary treatment by medication, psychosurgery, or electroconvulsive therapy. This is done in the name of the greater good, largely as a preventive policy. Conspiracy theories notwithstanding, it is impossible to ignore the enormous interests vested in psychiatry and psychopharmacology. The multibillion dollar industries involving drug companies, hospitals, managed healthcare, private clinics, academic departments, and law enforcement agencies rely, for their continued and exponential growth, on the propagation of the concept of "mental illness" and its corollaries: treatment and research. “The wording used in the DSM has a significance that goes far beyond questions of semantics. The diagnoses it enshrines affect what treatments people receive, and whether health insurers will fund them. They can also exacerbate social stigmas and may even be used to deem an individual such a grave danger to society that they are locked up ... Some of the most acrimonious arguments stem from worries about the pharmaceutical industry's influence over psychiatry. This has led to the spotlight being turned on the financial ties of those in charge of revising the manual, and has made any diagnostic changes that could expand the use of drugs especially controversial.” (New Scientist, “Psychiatry’s Civil War”, December 2009). Abstract concepts form the core of all branches of human knowledge. No one has ever seen a quark, or untangled a chemical bond, or surfed an electromagnetic wave, or visited the unconscious. These are useful metaphors, theoretical entities with explanatory or descriptive power. "Mental health disorders" are no different. They are shorthand for capturing the unsettling quiddity of "the Other". Useful as taxonomies, they are also tools of social coercion and conformity, as Michel Foucault and Louis Althusser observed. Relegating both the dangerous and the idiosyncratic to the collective fringes is a vital technique of social engineering. The aim is progress through social cohesion and the regulation of innovation and creative destruction. Psychiatry, therefore, is reifies society's preference of evolution to revolution, or, worse still, to mayhem. As is often the case with human endeavour, it is a noble cause, unscrupulously and dogmatically pursued. Another useful metaphor is to consider mental illness as a kind of self-perpetuating viral organism, which injects negative statements into the mind of the patient (nod to Cognitive-Behavioral Therapy, or CBT). Like every organism, it strives to perpetuate its existence, transfer its genes (its life-negating, dysfunctional, and self-defeating theorems), and fend off its enemies. Often, the patient reports feeling “invaded” or “body-snatched” by his disorders, which he experiences as “alien” to his core or essence. If mental illness is culture-dependent and mostly serves as an organizing social principle - what should we make of the insanity defense (NGRI- Not Guilty by Reason of Insanity)? A person is held not responsible for his criminal actions if s/he cannot tell right from wrong ("lacks substantial capacity either to appreciate the criminality (wrongfulness) of his conduct" - diminished capacity), did not intend to act the way he did (absent "mens rea") and/or could not control his behavior ("irresistible impulse"). These handicaps are often associated with "mental disease or defect" or "mental retardation". Mental health professionals prefer to talk about an impairment of a "person's perception or understanding of reality". They hold a "guilty but mentally ill" verdict to be contradiction in terms. All "mentally-ill" people operate within a (usually coherent) worldview, with consistent internal logic, and rules of right and wrong (ethics). Yet, these rarely conform to the way most people perceive the world. The mentally-ill, therefore, cannot be guilty because s/he has a tenuous grasp on reality. Yet, experience teaches us that a criminal maybe mentally ill even as s/he maintains a perfect reality test and thus is held criminally responsible (Jeffrey Dahmer comes to mind). The "perception and understanding of reality", in other words, can and does co-exist even with the severest forms of mental illness. This makes it even more difficult to comprehend what is meant by "mental disease". If some mentally ill maintain a grasp on reality, know right from wrong, can anticipate the outcomes of their actions, are not subject to irresistible impulses (the official position of the American Psychiatric Association) - in what way do they differ from us, "normal" folks? This is why the insanity defense often sits ill with mental health pathologies deemed socially "acceptable" and "normal" - such as religion or love. A mother bashes the skulls of her three sons. Two of them die. She claims to have acted on instructions she had received from God. She is found not guilty by reason of insanity. The jury determined that she "did not know right from wrong during the killings." But why exactly was she judged insane? Her belief in the existence of God - a being with inordinate and inhuman attributes - may be irrational. But it does not constitute insanity in the strictest sense because it conforms to social and cultural creeds and codes of conduct in her milieu. Billions of people faithfully subscribe to the same ideas, adhere to the same transcendental rules, observe the same mystical rituals, and claim to go through the same experiences. This shared psychosis is so widespread that it can no longer be deemed pathological, statistically speaking. She claimed that God has spoken to her. As do numerous other people. Behavior that is considered psychotic (paranoid-schizophrenic) in other contexts is lauded and admired in religious circles. Hearing voices and seeing visions - auditory and visual delusions - are considered rank manifestations of righteousness and sanctity. Perhaps it was the content of her hallucinations that proved her insane? She claimed that God had instructed her to kill her boys. Surely, God would not ordain such evil? Alas, the Old and New Testaments both contain examples of God's appetite for human sacrifice. Abraham was ordered by God to sacrifice Isaac, his beloved son (though this savage command was rescinded at the last moment). Jesus, the son of God himself, was crucified to atone for the sins of humanity. A divine injunction to slay one's offspring would sit well with the Holy Scriptures and the Apocrypha as well as with millennia-old Judeo-Christian traditions of martyrdom and sacrifice. Her actions were wrong and incommensurate with both human and divine (or natural) laws. Yes, but they were perfectly in accord with a literal interpretation of certain divinely-inspired texts, millennial scriptures, apocalyptic thought systems, and fundamentalist religious ideologies (such as the ones espousing the imminence of "rapture"). Unless one declares these doctrines and writings insane, her actions are not. we are forced to the conclusion that the murderous mother is perfectly sane. Her frame of reference is different to ours. Hence, her definitions of right and wrong are idiosyncratic. To her, killing her babies was the right thing to do and in conformity with valued teachings and her own epiphany. Her grasp of reality - the immediate and later consequences of her actions - was never impaired. It would seem that sanity and insanity are relative terms, dependent on frames of cultural and social reference, and statistically defined. There isn't - and, in principle, can never emerge - an "objective", medical, scientific test to determine mental health or disease unequivocally. "Normal" people adapt to their environment - both human and natural. "Abnormal" ones try to adapt their environment - both human and natural - to their idiosyncratic needs/profile. If they succeed, their environment, both human (society) and natural is pathologized. With Freud and his disciples started the medicalization of what was hitherto known as "sin", or wrongdoing. As the vocabulary of public discourse shifted from religious terms to scientific ones, offensive behaviors that constituted transgressions against the divine or social orders have been relabelled. 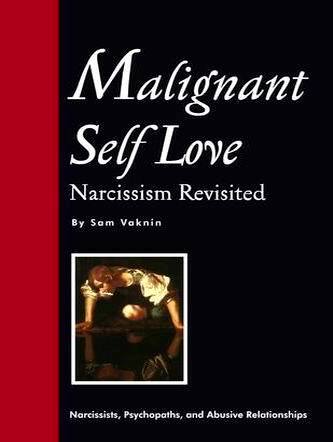 Self-centredness and dysempathic egocentricity have now come to be known as "pathological narcissism"; criminals have been transformed into psychopaths, their behavior, though still described as anti-social, the almost deterministic outcome of a deprived childhood or a genetic predisposition to a brain biochemistry gone awry - casting in doubt the very existence of free will and free choice between good and evil. The contemporary "science" of psychopathology now amounts to a godless variant of Calvinism, a kind of predestination by nature or by nurture.